6 Shelf Heavy Duty Universal Cart is constructed of heavy duty extruded oval tubing shelves that provide easy product access and selection. It is ideal for transporting various sized platters, trays, boxes and lugs. 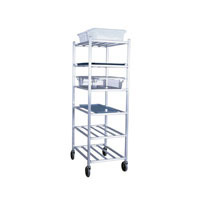 The cart is equipped with four 5" stem type swivel casters. Specs: size20 7/8"Wx67"Hx27"W, runner spacing 10 1/2". Available options are Caster Locks (2) and Vertical Bumpers.